Micellar Casein (Milk), Cocoa Powder, Maltodextrin, Gum Arabic, Potassium Chloride, Salt, Sodium Bicarbonate, Natural Flavors, Magnesium Oxide, Acesulfame Potassium, Xanthan Gum, Stevia Extract, Sucralose. DO NOT USE A SHAKER BOTTLE WITH HOT WATER. Add 1 serving (2 scoops) into a glass with 12 to 16 fl oz of hot or cold water and stir. For thicker consistency use less water. BEST TAKEN BEFORE BEDTIME. As with any supplement, if you are pregnant, nursing or taking medication, consult your doctor before use. Keep out of reach of children. Do not take more than one serving per day. Do not consume any alcohol while taking melatonin. Do not drive or operate heavy machinery while taking melatonin. Do not take with other melatonin-containing products. Consult a healthcare professional if you are experiencing long-term sleep difficulties. Micellar Casein (Milk), Gum Arabic, Maltodextrin, Potassium Chloride, Natural Flavors, Sodium Bicarbonate, Salt, Magnesium Oxide, Acesulfame Potassium, Xanthan Gum, Sucralose, Stevia Extract. The Hottest New Thing In Recovery! Each Serving Contains 30 Grams Of High-Quality Micellar Casein Protein! Get ready for sweet dreams of recovery! 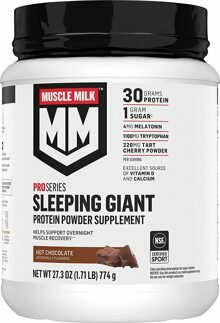 CYTOSPORT SLEEPING GIANT nighttime protein supplement mix supports the body's natural ability to repair muscle and recover during sleep. Each serving (2 scoops) provides a unique blend of high-quality (slow releasing) micellar casein, tart cherry powder, melatonin, tryptophan and magnesium. Melatonin helps promote sleep and relaxation which are important to overall health. CYTOSPORT SLEEPING GIANT is designed to be taken at night before bed to help with sleep and recovery. The main feature of the formula is micellar casein, which is a slow digesting type of protein ideal for before bed as it is intended to feed your muscles while you sleep. If you’ve been around supplements for some time, you’ll know that casein before bed is something that’s been done a number of times before. 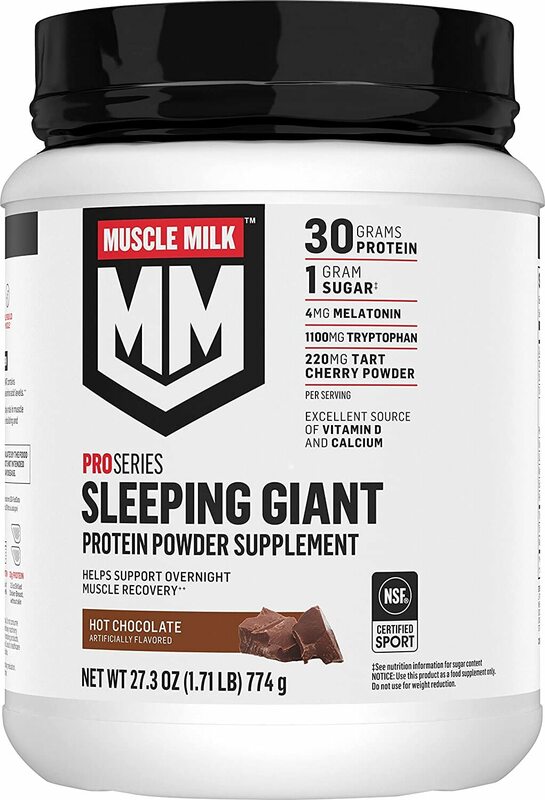 As mentioned, however, CYTOSPORT has mixed things up with SLEEPING GIANT and added in tryptophan and melatonin to improve sleep as well as tart cherry to reduce muscle soreness and increase recovery. The nutritional profile for CYTOSPORT SLEEPING GIANT is also quite lean providing 30g of protein, 5g of carbohydrates with a gram of that sugar and a gram fiber, 1.5g of fat, and a total of 150 calories. For those interested in the doses of the extra ingredients, those are available as well with tryptophan at 760mg, tart cherry at 220mg, and melatonin at 4mg.